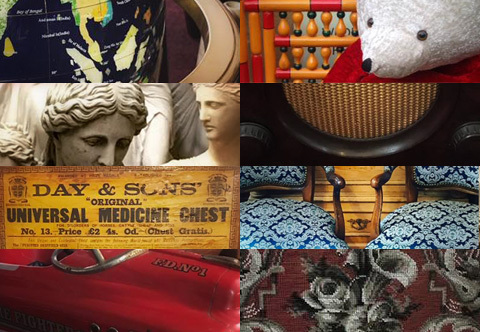 We buy and sell a wide range of antiques, collectables, bric-a-brac and quality second-hand furniture. From the smallest antique thimbles and jewellery to larger collector’s items such as signage and retro furniture we always have a variety on offer. Most of our items are available on eBay but we also have a showroom in Springvale, Penistone which houses overflow stock and new items which haven’t yet been listed on our online shop. J&B Antiques is an established, family-run business based in the historic market town of Penistone near Barnsley, South Yorkshire. Below you can see our 6 most recent eBay listings. For our entire list please visit the J&B Antiques eBay Live Feed page. Our new showroom has many items which aren’t yet available on our eBay shop. Why not pay us a visit for a chance to get a bargain before the world of eBay sees it? You’re welcome to browse without any obligation. The showroom is open on Thursdays and Saturdays, 10am – 4pm. You can see a map with our location on the Contact Page. Thinking of Selling? We’re always Buying! If you have items you think might be of interest to us then please give us a call. We’re always buying new stock and we can collect large items from you if necessary. What antiques and collectables do be buy? If you have large items such as furniture we can arrange to pick it up and save you the trouble of organising delivery. Our main area of collection covers the whole of South Yorkshire including Barnsley, Sheffield, Doncaster and of course, our home town of Penistone. These boundaries aren’t strict and we will happily collect from anywhere in Yorkshire. So if you have something of particular interest don’t hesitate to enquire, no matter where you live! Top prices paid for gold, silver, rings, coins, broken/scrap jewellery. For more info call us on 01226 766977 or 07771 795112. We also provide a professional house clearing service. Friendly, sympathetic and discrete, we can help with clearances related to bereavement, emigration, selling and letting. and if you’re simply having a clear-out, we can help with that, too. For more information please visit jb-houseclearance.co.uk. Join us on Facebook and be informed of our latest stock as it arrives. We update our page regularly and often have previews of items before we list them on eBay. Click the link above to see us or search for "JBHouseClearances". You can send us a quick message using this form. Remember to complete the captcha otherwise your message can't be sent. The main Contact Page contains a form for longer messages and also a map showing the location of our showroom.